If you have a growing family choosing to build a room addition is a great choice. In most cases it will cost less than selling your existing home and buying a larger one. 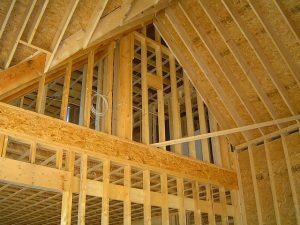 Whether building a family room addition or bedroom addition, it is important to understand the amount of work and planning that is required in such a project. Suffice it to it’s a lot of work. It’s like building a small house. As a result, it is critical for every homeowner to sit down and develop a well thought out room addition plan of action before going too far forward. Summarized below is a list of the key areas that should be considered and planned out before starting the actual construction of a room addition. By following this simple advice you’ll increase the likelihood of achieving the new living space that you envision. First, when developing a room addition plan start by writing down the purpose of the new living space, and your target budget. For example, are you looking to build a new master bedroom for you and your spouse, or are you looking for a bonus room for the kids? Depending upon the main purpose of the room addition you can better address follow-on considerations, such as do you want to include a bathroom in a master bedroom addition. Most master bedrooms have bathrooms attached to them; however, including a bathroom in a room addition adds a great deal of cost to the project. Second, when actually coming up with a set of room addition plans, e.g. blueprints, you may want to enlist the services of an architect. It is vitally important that the room addition be designed so that it ties in seamlessly with the exterior and interior of the existing home. An architect can help make this happen. The last thing you want is to slap on a room addition to the side of your home that looks like a big ugly afterthought. Curb appeals matter when selling a home, and having a room addition attached to the main home that doesn’t tie well into it could negatively impact the resale value of it. You may not care so much about this simple fact now, but later on when you go to sell your home, which we all inevitably do, you will care. So make sure your future home addition looks aesthetically attractive from the street. If you don’t want to hire an architect then at least buy a home design software package to help in generating the drawings. They provide a lot of tools that can help ensure you have an aesthetically attractive and functional room addition. They can also generate your bill of materials list to help cost out the project. This said, if your room addition plans involve having to deal with complex roof lines or elevation issues hiring an architect may be a smarter move. Another key consideration is the building permit process. I highly suggest visiting your local building inspector during the planning process of your room addition. They can be a valuable upfront resource in terms of making you aware of any property setbacks or easements you may need to contend with. It’s also good to establish a bit of a rapport with him/her as they will eventually be providing you with the necessary building permits and conducting the various inspections during the construction of the addition. Eventually you or your contractor will need to go back to the building inspector to pull permits for the project. The inspector will want to review your blueprints or detailed sketches of the project with dimensional information included. He or she will pay particular attention to cross-sectional views of the framing type and materials used. In addition, the inspector will confirm that the plans include the use of properly sized floor joists, roof rafters and wall thicknesses. Besides the construction permit, the inspector will also need to issue permits for electric, insulation, and any plumbing work required. Normally the respective sub-contractor will have to pull these permits. Lastly the building inspector will look at your bill of materials list and your estimates for the overall cost of the project. He will use this cost figure to assess the appropriate permit fees. Once you have your room addition plans and permits in place, and have hired a general contractor you can then break ground on your project. However, keep in mind that during the construction you or your general contractor will need to call in the building inspector to approve work done as your project progresses. Typically the building inspector will want to come out to your jobsite several times during your room addition construction. For example, he/she will want to visit the jobsite after the foundation is poured, the rough framing is completed, the rough electric and plumbing are installed, and the insulation installed. Finally, the inspector will make one last examination of the project after the room addition is complete. If it meets his/her satisfaction they will issue you an occupancy permit so that you can legally use the space. This also triggers the local property tax man to come pay you a visit with his hand out. Regardless if you are using a general contractor or are acting as you own general contractor, put together a detailed schedule of the project. Make sure to include estimated start and complete dates for every phase of the project. This way you can track how your room addition project is progressing and know when to make heads-up calls to subcontractors to let them know you are expecting them to be on the jobsite soon. All of the room addition planning that I have mentioned is critical for the success of your project. It is also vital for obtaining any financing you may need. Like the building inspector, banks will want to see blueprints, project costs, and schedules before they provide you with a loan. They may also require that you use a licensed general contractor. So do all your upfront homework and planning before actually building your room addition. Not only will you mitigate the number of headaches you get during the construction of it, but you’ll also save yourself time and money in the end. 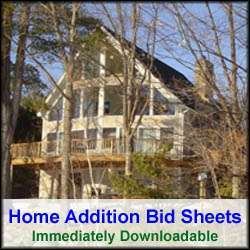 For more help on building a Room Addition, see HomeAdditionPlus.com’s Room Addition Bid sheet. The Room Addition Bid Sheet will help ensure that your room addition project goes smoothly and is completed on time and budget.